The Davidson-St. Louis matchup this Saturday may have been the most anticipated game of the conference season. Projected as the first and third place teams in the official preseason poll, both teams quickly emerged as leading contenders for the conference and held the top two positions in the A-10 Talk writer ranking for weeks. Even with the emergence of other contenders like VCU and Dayton, this game still loomed large. It lived up to the hype. Davidson has had St. Louis’s number since the Wildcats joined the conference. Before today, the Wildcats had won four of five matchups against the Billikens with both teams as members of the A-10. Peyton Aldridge ended the Billikens season last year behind a 35 point (6/6 from deep) performance. Each of the past two years, Davidson had traveled to Missouri and come home with a victory. This year looked different: Saint Louis came in to the season as the preseason favorite, and was the only undefeated team in the conference as late as the week. With 0.4 seconds, a player who had gone 8-9 from the line had two free throw attempts to tie or win the game. Neither went down. This Davidson team is about defense. Davidson’s strong A-10 teams have been reliant on their offense. The 2015 team that went to the tournament was ninth nationally in offense and 176th defense team. The next year Davidson was 31st on offense and 223rd on the other end. Last year’s squad was the 16th best offense in the country, and 120th on defense. For the moment, this year’s squad is 148 on offense and 62nd on defense. That would easily be the Cats best ranking on defense and their worst on offense. Davidson has the best scoring defense of any team in the conference. 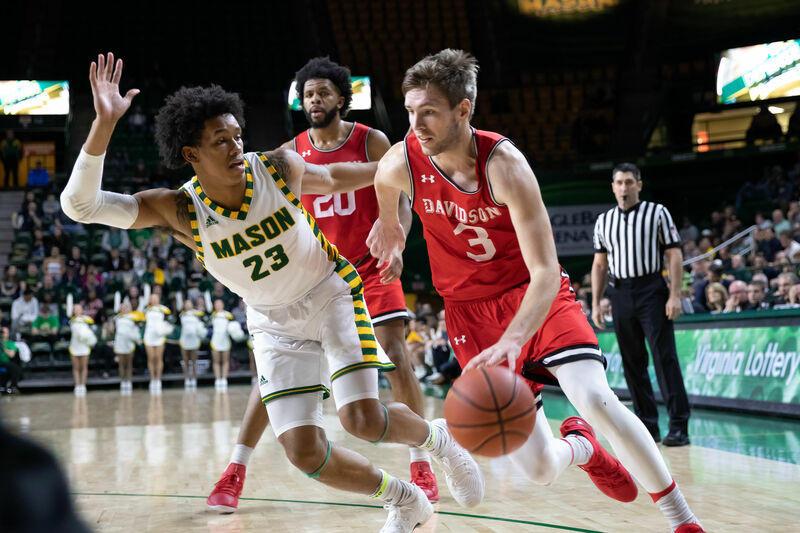 Each of the upper echelon teams the Cats have played in conference (Duquesne, George Mason, VCU, SLU) have scored their conference low against Davidson. Credit for this rise should be widely shared. Davidson starts no one under 6’4: all their guards are good at getting their hands up to challenge perimeter shots. Kellan Grady has improved as a defender, and Luke Frampton is great at drawing offensive fouls. Luke Brajkovic is already a very good interior defender, despite some athletic limitations. Jon Axel Gudmundsson is a positioning genius, always in the right place to grab a steal or clean up the glass. Bob McKillop also deserves credit for switching between zone and man defense possession by possession, which continues to catch teams off guard. Davidson needs better late game offense. In Davidson’s third to last possession today, Luke Brajkovic caught the ball a step or two inside the three point line on the left elbow. He looked around for a second and then decided to back down Hasahn French, one of the best post defenders in the A-10. Brajkovic had not scored a single point at the time. After several dribbles, French went down and got a charge call on Brajkovic. This was an odd play to run when Gudmundsson was 9-12 for the game with 25 points at the time, and his backcourt mate Kellan Grady may be the best offensive player in the conference. Furthermore, Luke Frampton has been scorching from deep for several games. Yet clinging to a two-point lead, Davidson went with an out-of-position post-up from a player who had not scored all game. Though an important play, this was still was only one possession. Davidson got a stop and got the ball back with another chance. Confoundingly, they did the exact same thing next possession. This time Brajkovic bricked a hook shot with plenty of time remaining on the shot clock. The young Austrian big man is one of the best freshman in the conference and has some sweet post moves, but he needs to remember time and place. After Dion Wiley hit a three and Bob McKillop called timeout, Jordan Goodwin bailed Davidson out with a bad foul and then of course the two missed free throws. Nor was this the first Davidson game where the team failed to get great shots down the stretch. In their two crucial losses to Philly schools, Davidson’s offense went awry down the stretch. Against St. Joe’s, Luke Frampton ended up driving to the hole (something he almost never does) to throw up an off-balanced shot with about thirty seconds remaining. With time expiring in overtime against Temple, Kishawn Pritchett threw a telegraphed pass that resulted in a dunk for the Owls instead of a final shot for Davidson. Going forward, Davidson should put the ball in the hands of Grady or Gudmundsson down the stretch. It worked on the final possession today, and is the best option for the team in the future. Davidson has the inside lane for the #1 Seed in Brooklyn. Less than halfway through the conference season, Davidson has already played its only game against VCU, SLU, George Mason, and Duquesne. They emerged with victories in each one of these games, which could be useful in a tiebreaker situation. The Wildcats still have two games against URI and a home matchup against Dayton. They’ve already lost one road game to an inferior opponent on the road. To maintain a shot at a regular season title and an at-large bid, Davidson will continue to need to grind out games on the road. But given the remaining schedules of the league contenders, the smart money is on Davidson to win the conference after today. Bob McKillop has done an incredible job (again). Travis Ford was an 89% free throw shooter in college. Perhaps his ease at the line, makes him less likely to practice free throws or to recruit players strong at an aspect of the game he considers easy. Whatever the cause, his team has blown several games with missed free throws, though none in as painful a fashion for SLU faithful as today. Jordan Goodwin will be back. In a league full of talented underclassmen, Goodwin is near the top of the list. He is already one of the three most versatile players in the league. He has a long career ahead of him and I am confident he won’t the last six seconds of this game define him.